Variator chains are designed for infinitely variable shaft rotation speed control under rotational moment conservation. These chains are widely used in conveyer drive heads and cutting machines especially at car and heavy equipment industries. 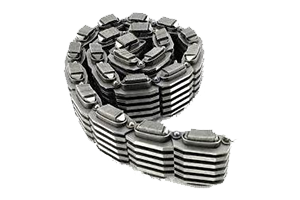 Variator chains consist of hinged links made of high-strength steel.